In 2010 the iconic British chocolate manufacturer Cadbury was taken over by the US food giant Kraft. The deal caused a public furore and prompted many to ask whether we should be allowing such a major national enterprise to fall into foreign hands. Yet, despite the hand-wringing, there was nothing unusual about what was going on. In recent years hundreds of billions of pounds worth of British businesses have been sold off abroad. 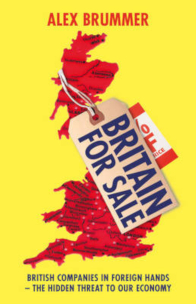 Today, foreign companies control vast swathes of the British economy, from ports to bridges, from the National Lottery to airlines, and from high tech companies to gas and electricity suppliers. In Britain for Sale, award-winning financial journalist Alex Brummer explains why British companies are so irresistible to overseas buyers. He considers the impact of foreign deals on Britain’s enterprise culture. And he asks the key question: How damaging is the takeover bonanza to our future economic health? First published by Random House (UK) in 2012.